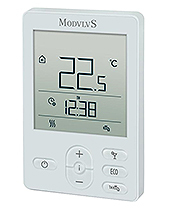 The RCD2 room unit is the remote control of the heating system, designed to select the room temperature and the operating mode of the climatic controller AHC40 and CMP25-2 (software version 3.2 or later) in an easy and comfortable way. The best placing is in the centre of the house, where there are the most significant climatic conditions of the building. The wide backlit display shows information about the temperatures and the operating mode. Moreover it is possible to select personalized functions such as Party. Eco, HDW heating. Dimensions: 82,7 x 125,7 x 17 mm.